Leslie Frazier has led the Vikings to a respectable 3-2 record since taking the helm. But does the Rooney Rule prevent Minnesota from locking him up now as coach for next year, even though he's African-American? Yes and no. 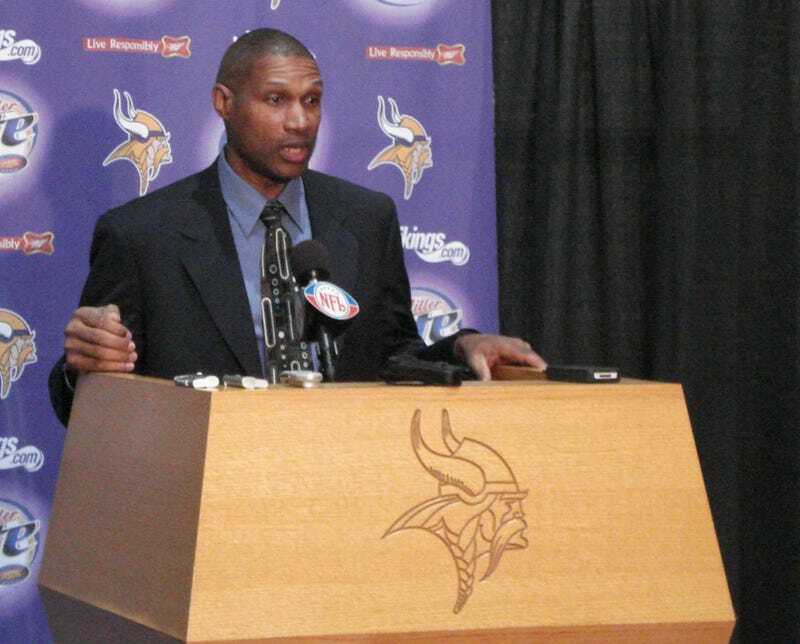 We don't know for sure that the Vikings will hire Leslie Frazier. But Schefter and King think they should, he wants to be back next year, and they'd be a fool not to hire the guy who regained a team that had quit. But the Rooney Rule, put into place to raise the rate of minority hires, means they can't offer him a contract just yet. The most well-known provision of the Rooney Rule requires teams to interview at least one minority candidate before making any hires. So what happens when the guy they want is already a minority? Do they have to call in a white guy for appearances' sake? Or Ron Rivera? Nope. If the Vikings want Frazier, and he wants the Vikings, the job's his. The situation has come up twice before, with Jim Caldwell and the just-fired Mike Singletary. The situations were different — Caldwell was Tony Dungy's handpicked successor, and Singletary was the fiery interim coach who earned the job with a strong showing — but neither team had to interview any other candidates. But this doesn't mean Minnesota can just give Frazier the job tomorrow, because of a possibly misguided attempt to close loopholes. The Rooney Rule prevents teams from offering a contract to interim head coaches so they can't just hire them without having to go through the interview process. This means Frazier, minority or not, can't be named next year's head coach until this season ends. Specifically, the exact minute this season ends. In 2008, the 49ers announced Singletary's multi-year deal just hours after their final game of the season. So if the Vikings want to get this done fast, they've already had informal talks with Frazier, and will officially offer him a contract on Sunday evening. Interestingly, Frazier has interviewed seven times for various head coaching jobs, at least some of those, we presume, simply to satisfy the Rooney Rule. Certainly the Seahawks knew they wanted Pete Carroll when they called Frazier in. What does he have to show for it, other than seven fruitless round-trip flights? I suppose they contribute to the perception that he's one of the most qualified black assistant coaches, which is pretty insulting when you think about it. It's pointless to debate the merits of the Rooney Rule, when the percentage of minority executives in the NFL has skyrocketed since it was instituted. (It's also fruitless to speculate on whether it actually led to any hires, because no team would publicly admit it.) But we do question the wisdom of forbidding the hiring of interim coaches. If a team wants a guy and vice versa, it's a charade to make them pretend they're not negotiating until season's end. Jerry Jones knows it's stupid; he's asking for an exemption to hire Jason Garrett. And for in-demand names like Garrett and Frazier, it's not fair to anyone to keep them from signing contracts now. Their current teams run the risk of having them snatched away in the offseason. Other teams can't contact the interim coaches until next week without being charged with tampering. And the interim coaches are forced to wait for their big break and big payday, when you never know what might happen in the meantime. The Rooney Rule's done some good work. It just needs a little work.